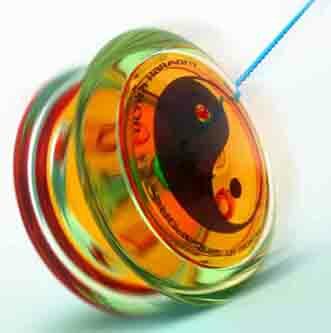 The Yoyo Effect represents the ups and downs of life we all face in the duality of physical reality. For some the ups and downs are gentle, while for others they go to mood swings that are out of control, the yoyo often coming to a stop at the bottom when one feels unstrung. In a 'Yoyo Relationship' a couple goes back and forth trying to work out their differences until they come to closure. The yoyo as yin and yang references the merge of above and below at the end of the loops, or spirals of time, when all returns to the palm of your hand, in balance. The initials YOYO mean, "You are On Your Own". You come in that way and leave that way. This is your experience.